Question: who is the author of The Cat in the Hat? What about The Sneetches? Horton Hears a Who? There’s a Wocket in my Pocket? 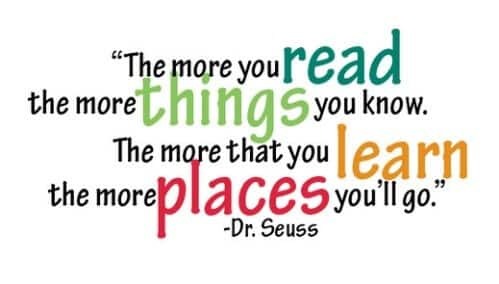 We know him today as Dr. Seuss: the wonderfully clever poet and illustrator who wrote 60 books that have sold over 600 million copies all over the world. His real name is Theodore Seuss Geisel. Theodore Geisel was born in Massachusetts, and originally decided to go to college to get a degree in English literature. He was planning to be an English teacher. While in college, he met a girl named Helen, who encouraged him to instead become an artist. But life as an artist can be pretty difficult. Theodore had a hard time getting work at first, but his skill as a cartoonist was eventually discovered. 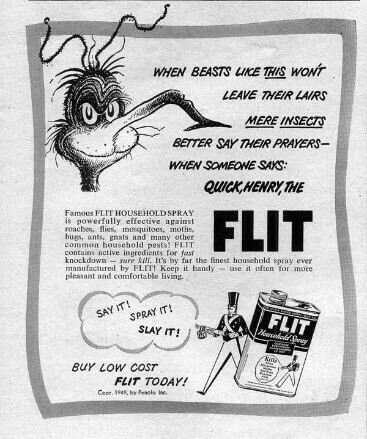 He got a job working for a company that sold bug spray, and created a character to advertise their products. He began to make more money, and finally had saved up enough to marry Helen. One day, Helen and Theodore were returning from a vacation in Europe, when Theodore decided to try writing a book. He came up with the story for And to Think that I Saw it on Mulberry Street. He tried sending the manuscript to many different publishers, but no one wanted to publish it! After about 20 tries, Theodore was very discouraged. However, the book was eventually published by Vanguard Press. Even famous authors can have a rough start at their career! Theodore really cared about children. He loved to write stories for them. Not only did he write many storybooks for children, he also wrote books that had simple words, so that kids could begin to read his books for themselves. Even though he loved writing stories for children, Theodore and Helen never had any children of their own. The Yooks and the Zooks are neighbors. They live on opposite sides of a wall. They hate each other, simply because Yooks eat their toast with the butter-side up, while Zooks eat their bread with the butter-side down. Naturally, this is cause for a war. The weapons keep getting bigger and bigger…but what will happen in the end? This is a great book to use in a unit on the Cold War. It uses odd characters and a ridiculous setting to retell the story of the arms race. The book ends as a cliffhanger, which encourages kids to think about the effects of the Cold War, in addition to capturing the spirit of fear that characterized that time in American history. King Derwin of Didd is sick and tired of the weather. Every year, the same four things come down from the sky. As king, he orders his royal magicians to come up with a new kind of weather. But that decision proves to be a dangerous one. 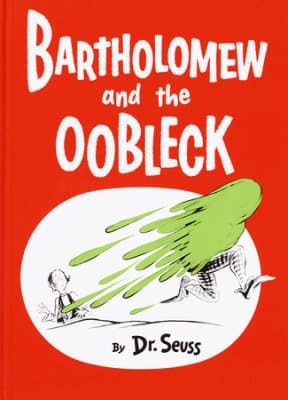 When the stuff-oobleck- begins to fall from the sky, horrible things start to happen. And the fate of the kingdom rests in the hands of a very clever page boy named Bartholomew. I love this book for its message: discontentment never gets you anywhere. 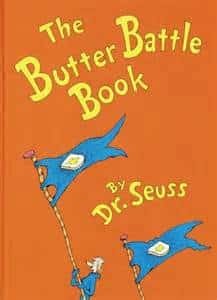 While this book may be a little long for a read-aloud, it’s a great story, and can also be used for some fun activities! (See the resource room). Describe the person and tell why they are your hero. You can send in your writing using our contact page. We’ll send you a message back to confirm that we got your story. 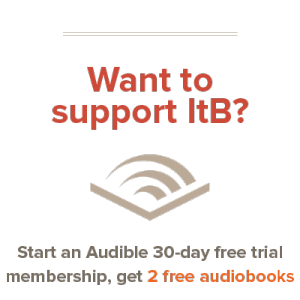 We will pick a winner, who will have their piece published in the next column of Just Getting Into the Book, AND will receive a free mystery giveaway of a favorite book from our ItB Team! Make your own icky, sticky oobleck using the recipe below! Cleans up easily! Hope you’ve enjoyed this issue of Just Getting Into the Book. Be sure to check back in April for more great content! You can see all issues of Just Getting Into the Book at this link.